Become An "Office Fortune" Founder | Earn As An Authority! Gain The First-Movers Advantage! Get Positioned Before The Masses! Earn Fast! Get More Sales & Leads For Your Business! EVERGREEN MARKETING WITH NO DOWNSIDE! What is The AllChamber Cloud-Based Chamber of Commerce? AllChamber is the first decentralized, cloud-based Chamber of Commerce. We break down barriers such as no physical location needed (dramatically cutting our overhead expenses), No special qualifications to be a member, NO fees to be a member (just a small payment to cover processing the order). No per-employee fees. No manuals or CDs to clutter your office. No meetings to attend. No Financial Documents Required. No Learning Curve. No Bureaucracy. No Red Tape and Non-Political. Plus, you get a Chamber of Commerce AAA+ Rating for your business. How Does The Chamber AAA+ Rating Help My Business? It’s a credentials tool. It’s been proven for years that “credentialed” tools will get more sales conversions for your business. It also makes your customers feel warm-and-fuzzy about doing business with you. Your AAA+ Rating never fluctuates and is immediate. In regards to complaints (should you have any), we forward them to you and NOT the media, social networks or Google. In other words, we never tarnish your name. 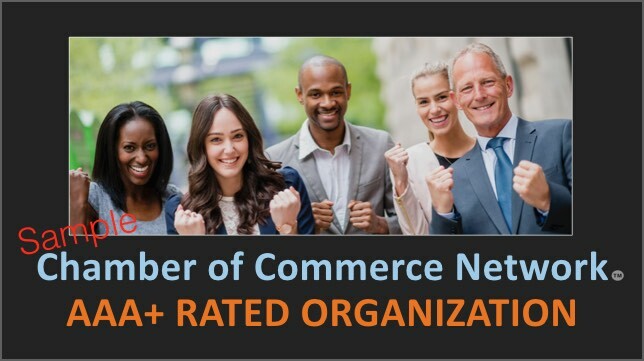 Your Chamber of Commerce Rating also works perfectly with any other “credentialed” tools such as the BBB (better business bureau), Yelp, Business Associations and of course, can be used to enhance your local Chamber Membership as well. You’ll also get (included), the AAA+ Rating logos for your business. What Are Some of the Other Benefits Included? You’ll get all types of benefits and services to help your business grow, save on operating expenses and build your business skill-set. Here’s just some of the benefits: Free Discount Medical Benefits Program with no upfront or monthly fees. Use it yourself or for UNLIMITED employees (USA Only). Discounts from National Merchants. Free Payroll Services. Build Your Business Credit (no credit check. Over 15 vendors). How to Build Your Local Business Tool. How to Protect Your Ideas. 100% Barter Free Network (no fees). Tons of Free Business Graphics and Over 20 Pre-Made TV Commercials for twenty different industries … Plus lots more! How Does The Distribution Licensee Work? When our Chamber of Commerce Network was available in a physical, terrestrial environment (now only cloud-based), it sold for $395.00 (that’s the minimum value). As a Cloud-Based Chamber of Commerce “Distribution Licensee,” your clients, customers, donors, prospects and associates will get the Cloud-Based Chamber directly from you for FREE! (A small $7.95 processing fee applies and is paid by the client). The processing fee is used to cover our administration & overhead costs, maintenance of each account, full-access to everything, ongoing support and updates for an entire year … By the way, at the end of the annual subscription, when YOUR customers want to renew, they simply pay the processing fee again. Your Distribution licensee, allows you to Giveaway Unlimited Chamber of Commerce Network Memberships. Why Are You Doing This? What’s in it for The Chamber? Cloud-Based Chamber, AllChamber.com was designed to be so “irresistible” that virtually every business person would want one. The massive numbers achieved by people using the program, will give us access to major sponsors and funding organizations. This will give Cloud-Based Chamber, AllChamber.com the Branding and exposure it needs to help change the landscape of what “Local Businesses” and “Local Entrepreneurs” need to succeed. Remember, We are “decentralizing” and “disrupting” the Chamber of Commerce as it’s currently known. Want in? Cool, I Get My Distribution License, What Happens Next? Call us at my new distributor line: 713-259-2887 and leave a message that you’ve sent the email with Your PROMO CODE. We will begin your account setup (usually within 24-hours) and notify you when your account setup is complete. Please Note: Speak clearly and slowly when leaving the phone message so we get your information correctly. It’s Best Practices to have a lead capture system, but it is not mandatory. However, there are plenty of free capture forms to get or you can use your favorite autoresponder service. So, BEFORE you direct any interested party to the Chamber, have them complete your capture form or autoresponder first, this way, you can contact them anytime later. Once they fill out the form, simply have form redirect to: www.AllChamber.com with your Promo Code for them to register. Simply direct your prospects to: www.AllChamber.com (or your preferred capture form), they will see the membership information just like you did, they click on the sign-up link and simply join with YOUR promo code. Saving $395! Market Our Distribution License – Make Money Now! AllChamber.com Has Unlimited Opportunities! As a paid Licensee, this also makes you a Qualified Affiliate (should you choose to market our license). Here’s how it works. The retail for the license is: $297. HOWEVER, if someone purchases the license through one of our “authorized” licensees (which could be you), they can save $100 and you make $100 per-sale. As a licensee, prospects will pay YOU directly, upfront, the FULL $197. This way, you’re never having to wait for your commission (you’re getting paid daily). Use any method of payment collection you want. Then, once you receive payment, you’ll forward to ALLCHAMBER the balance of $97. We prefer payment by PayPal, but of course, if other arrangements need to be made, that’s ok. Need our PayPal info? We will provide it upon your License approval. Our Program Will Definitely You More Targeted Leads & Customers. Here are But a Few Examples of How Our Proven Program Can Get You More Sales! Print Shops … The majority of customers at “print shops” are business people. “Get your business cards from us, and receive a FREE $395 Cloud-Based Chamber of Commerce Membership with over 50 benefits and services to help your business grow, save on operating expenses and build your business skill set.” Result: Have a marketing advantage over your competitors. Give more value to your customers. Insurance Agents want more business clients. Here’s how they can get them. “Business owners, call us for a free insurance quote and receive a FREE $395 Cloud-Based Chamber of Commerce Membership with over 50 benefits and services to help your business grow, save on operating expenses and build your business skill set.” Please note: If you’re a captive agent, you can still use this program to generate more leads for your business. Furthermore … It gives you the perfect opportunity to reach-out and give existing clients, their own Chamber Membership and of course, while doing that, you can give them an update on YOUR latest insurance products they should be using. One customer can more than pay for your distribution license. Result: You’ll get more and larger clients (businesses). More leads means more business. Cloud-Based Chamber can make a great “thank you for subscribing or liking us” on ANY of your social networks. Remember. You can giveaway unlimited memberships to help build your social network. Result: Imagine building your social network because of this ethical bribe. Do you have a Newspaper, TV Show, Radio Show, Podcast, Blog and so on? There’s lots of business people who watch or read your media. Use Cloud-Based Chamber as a “thank you” for subscribing to your list, subscribing to your podcast, as a closer for a purchase, as an incentive to come to your “special event” and more. Result: Get more people to take a call-to-action for subscribing to your media and special events. Need donations? Imagine approaching businesses with the concept of giving a donation, and in exchange, they’ll receive: “A FREE $395 Cloud-Based Chamber of Commerce Membership with over 50 benefits and services to help your business grow, save on operating expenses and build your business skill set.” This is something businesses and business people can actually use, as opposed to Candy Bars or Bingo Tickets. PLUS, YOU get to keep 100% of each donation and be able to offer UNLIMITED Chamber Memberships. If you use our program, donations received will out-way the price to be a licensee. You cannot lose. In addition, it gives you the perfect reason to contact your previous donors for new donations. Result: Bottom line … You’ll get MORE DONATIONS for your cause, and, you’ll have a specific marketplace (businesses and business people) to get those donations from. Result: Imagine getting more customers bringing other customers to your coffee shop. And, imagine selling additional cups of coffee to walk-in customers just for ordering one additional cup of coffee. Example: (Coffee Shop) “If you order one extra coffee to go, we can throw in a FREE Chamber of Commerce Membership. Use Cloud-Based Chamber to get more people viewing your opportunity and show up for more webinars and conference calls. Furthermore, Cloud-Based Chamber is not a network marketing program, it gives you the ability to get more mainstream people interested in your opportunity. Result: Get more mainstream people involved in your program, which will build your organization far beyond just traditional network marketers. If your target market is business people or business owners, our program is perfect fit for you. You can “bundle” Cloud-Based Chamber right into your membership or subscription package. Remember, It’s the client that pays the $7.95 processing fee, NOT YOU! Please Note: You do have the option of paying the fee for the client, and including it in your membership or subscription package, however, we have found it’s NOT necessary. Result: Imagine creating greater value for your customers, which in turn, You close more deals. Here’s how to use our program if you’re doing webinars or seminars. DON’T give them a FREE Cloud-Based Chamber just for showing up, give them one for staying (or listening) through the entire presentation. But of course, it could be used either way. Result: Get more people in your “seats” to watch your entire webinar, seminar, conference call or video. Lots of business people use mail box rental places. Cloud-Based Chamber makes a great incentive or “thank you” for renting a mailbox from YOU! Remember, it would cost your prospect $395 if they go to our website directly without your promo code. Result: When someone enters your location to ask about a mail box rental, they want one, it’s just a matter of the terms. Offering the Cloud-Based Chamber (and saving them $395), plus, giving them over 50 other benefits to help their business grow makes for happier customers and a competitive advantage. You’ve seen credit cards and debit cards that offer various value-added benefits just for getting or USING their card, right? Well how about this: “The next time you make a purchase with your card, you’ll receive a FREE $395 Cloud-Based Chamber of Commerce Membership with over 50 benefits and services to help your business grow, save on operating expenses and build your business skill set.” Or, look at all the benefits and services you can receive just for getting your card today. Result: Increased value and benefits for potential cardholders and card buyers. Plus, you’ll get greater call-to-action to do a transaction or for getting an additional card. The added transactions or additional cards purchased will far exceed the distribution license price. Whether you provide Office Supplies or Services, Merchant Accounts, Business Consulting Services, Coaching and so on, Cloud-Based Chamber can be used to help grow your client’s business and be thankful YOU were able to provide it to them. Result: By adding all of the other 50 benefits and services, imagine what that could do for your bottom line. Example: Let’s say you’re selling office machine printers. Just for looking at our printer DEMO, get a FREE Chamber of Commerce Membership. Have You Written a Book About Business? The AllChamber Cloud-Based Chamber is a great incentive to purchase your book. Just think of the tons & tons of added value you’re providing. Also, what a great gift to give your previous buyers. Re-contacting your previous buyers also gives you the perfect excuse to present all your new books (or other stuff). Result: More book sales, re-orders, upgrades and cross-sells. Gurus … Are you selling SEO, Website Services, How to Get New Business Information and virtually anything else being offered to businesses or business people? Cloud-Based Chamber is for you. Result: Our program fits perfectly as a “wrap-a-around” with YOUR program for additional massive value. In other words, more sales for your product or service. What is The Pricing For a Distribution License? Your “distribution license” includes authorization to giveaway UNLIMITED CHAMBER MEMBERSHIPS and you’ll also be an Authorized Affiliate (should you choose to market our licensing program). PLUS … You get your own private PROMO CODE (of up to 10 characters), so when you invite people to the chamber membership sign-up page, they’ll need YOUR promo code to pay only the $7.95 Membership processing price. Without YOUR code, they’ll pay a $395 Chamber Membership price. Please Note: To become a Distribution Licensee, There’s a TIME-LIMITED $297 Offer. Save $100 Off The Distribution Licensing Fee Today! It’s Reduced to Only $7.95 to Sign-Up for The AllChamber Membership with PROMO Code “FREE”? Ok … What’s The Catch? CLICK LINK BELOW – Use PROMO CODE “FREE” for $395 Discount to register your AllChamber Membership. Remember. you are entitled to offer the same discount to your prospects with YOUR PROMO CODE.